I decided long ago, any day that starts at an airport, a bridge, or a ferry is going to be a good day. This trip had us starting at the Cross Sound Ferry in Port Jefferson. 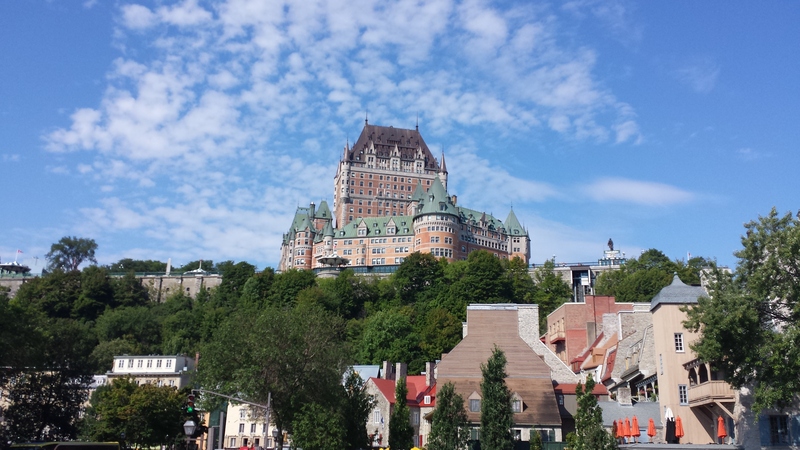 If you had asked me on the ferry what I thought about Quebec City before this trip, I would have not been able to tell you much. There is a vague recollection of doing a report on Quebec around fifth grade. The men were fur trappers, maybe religious, and the winters are brutal. If you ask most Americans to be honest, I think they would say everybody from “up there” speaks French, are rude, arrogant, and probably hate everybody. The town is probably dark and cold, and I think there’s a river near by, I guess that’s where they caught beaver and otter. As with all travel, this stereotype would be blasted right out of the St. Lawrence River in no time at all. We drove through Connecticut, then Massachusetts, and into Vermont. Nothing quite like a long drive to open lines of communication and just talk and laugh for hours. A brief stop in Brattleboro, Vermont found us noshing on sandwiches and fresh juice at a groovy little café on Main Street. Back on the road, it’s going to be long day. I love how outside New York, drivers actually use the right lane for cruising, the left for passing. I’m sure someday I’ll write a long rant on that alone. The border crossing was a welcome sight, and an opportunity for a new learning lesson. We had the youngest member of our tribe along with us for this trip. Of course his Passport has more entries than most adults acquire in a lifetime, and we are always fully prepared to provide proper documentation. However, this time, the Border Agent, who was otherwise very friendly, asked us for a notarized letter from his birth father, granting permission to leave the country. We’ve never needed one before, we explained, why now? Well, apparently there is a rash of international custody battles. We spoke it over with her, and after some slight persuading, she obliged and let us pass. Phew, that was close. And the kid in the backseat was perfect, never said a word, as we direct him to behave with all Customs and TSA agents. We stopped in a little town called Magog, not too far from the border. A tremendous amount of restaurants located along Main St., considering we hadn’t seen any population for the last 100 miles. With some reluctance to eat unfamiliar food, and all signs and menus in French, it took a little while to decide where we’d eat. An outdoor seating hamburger joint caught our eye, so we settled on that. Over an hour later, and after more than a few language related misinterpretations, we left praying that the food and service would be better in the city. 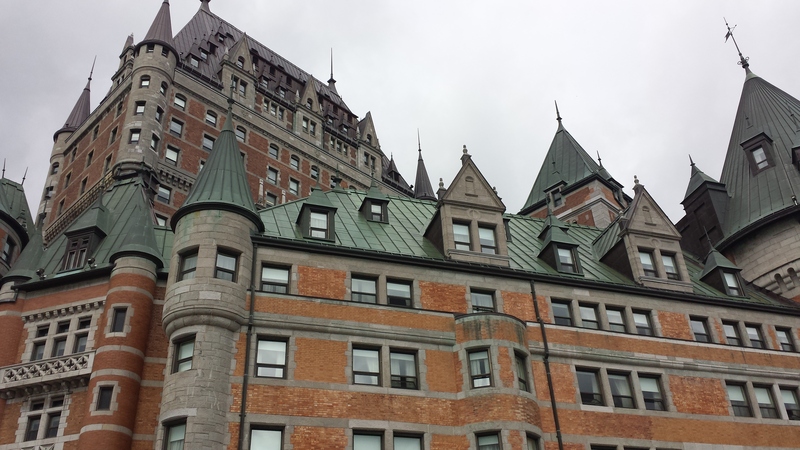 Our final destination brought us to The Fairmont Chateau Le Frontenac, known as the most photographed hotel in the world. A magnificent 622 room castle, it was built, accordingly, on the highest ground in the city. 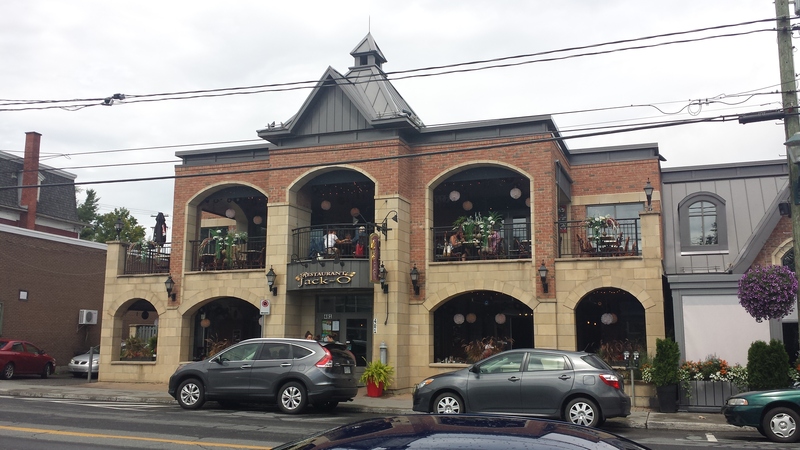 The brick façade and mansard copper roof are visible from nearly anywhere in the city, but looks most splendid from the banks of the St. Lawrence River. We had a suite on the 14th floor, and enjoyed the benefits of the Gold Level Service. A private breakfast and evening cocktails were just some of the included amenities. While the weather was gorgeous in the morning of our first full day, we learned the climate changes faster than anything here. The cloud cover was a welcome respite from this very hot summer and added ambience to the old European-style city. From the cobblestone streets, to gas lamps, to the corner butcher, not much has changed through the centuries. We jumped into the hop-on, hop-off, double decker red bus. It really is the best way to get your initial bearings in any unfamiliar city. The 90 minute tour started outside our hotel entrance, in Terrasse Dufferin. This area has a beautiful boardwalk that overlooks lower city and the river. The funiculair is located here and it is a popular spot for street performers. These are not the current type of annoying Times Square, SpongeBob Squarepants, or Minny Mouse characters that look for a picture with you and then aggressively hound you for money. These are people that play the Harp, or sing beautiful operatic melodies, or they perform magical card tricks. These are trained acrobats, jugglers, and comedians. They don’t harass and they don’t accost. In classical French Vaudevillian style, their culture and history come through in all their acts and personalities. Never a disappointing performance, always worthy of our pocketchange. The entire time we were in the city, we saw one policeman. Just one. And he was just hanging out minding his own business. No heavy artillery, no attitude. So in this happy place, we started our tour. Our guide, with full French-Canadian accent, requested we stay on the bus for the full 90 minute tour. Afterward we could decide where to get dropped off. He was an excellent tour guide, very knowledgeable with a sense of humor. Much focus was pointed toward the roof tops and architecture of the buildings. Discover the roofs, and you will find the history, was much of the refrain. Mansard roofs, tincan roofs, the flat roofs of the 1960s. 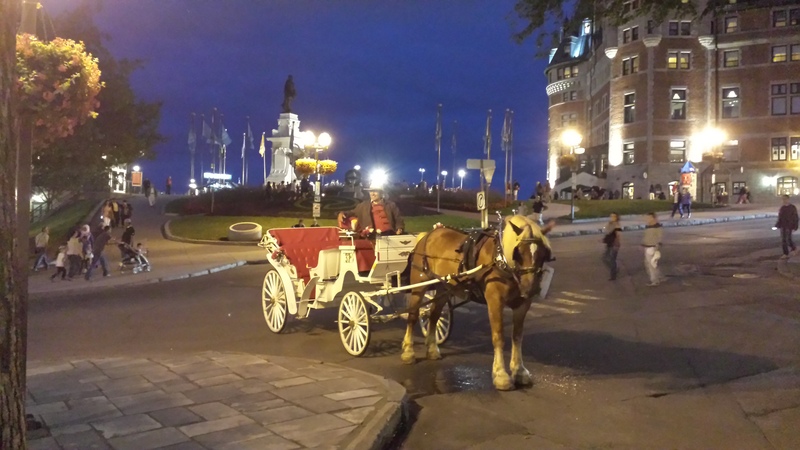 We saw the famed Musee de Civilization, a marketplace, Break Neck Steps Street, government buildings, and the historical Plains of Abraham. A beautiful, clean city, I couldn’t help but fall in love during that 90 minute tour. But we decided the best place to be was right where we were, at Le Chateau. The next few days were spent sightseeing mostly on foot. We enjoyed a guided river cruise to Montmorency Falls, a waterfall taller than Niagara. We spent a lot of time window shopping in Lower Quebec, and people watching on Terrasse Dufferin. The Changing of the Guard at the Citadel is a drawn out, but interesting, event to see. But mostly, we ate. 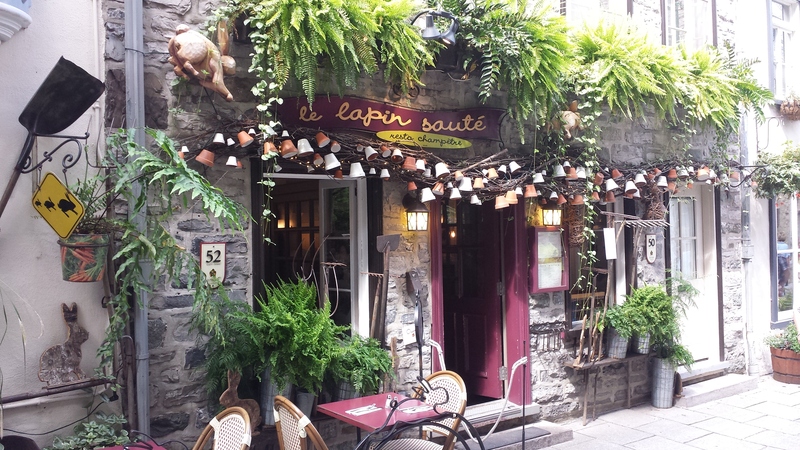 The food is where the French culture is still at it’s strongest. Sounds of café music and Madeleine Peyroux reverberated around the city. The constant clanging of wine glasses and the aromas of fresh food were everywhere. Service was generally impeccable and exceptionally friendly. This charming old European city gradually came alive to reveal it’s more cosmopolitan side. Ahh…. which brings me to the Poutines. How this ridiculous mishmash of cultural cuisine has not taken off in the States amazes me. French Fries drenched in brown gravy with white cheese curd, I enjoyed mine with pulled pork and bacon. Washed down with a Moosehead Lager, I could feel my blood thickening as I took it all in. Our last night brought us to the circus. 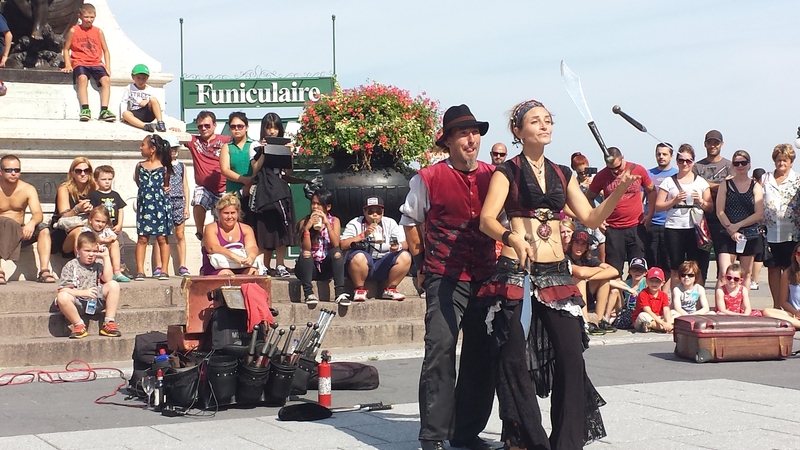 Quebec is the home of the original Cirque De Soleil, and to pay homage to it, the city funds a free, outdoor, performance every night. The 45 minute wait on line for this 2,000 seat amphitheater is well worth it to see these amazing young performers practice their craft. A rich history. Fine culture. Magnificent cuisine and wonderful music. An extraordinarily low unemployment rate. Virtually zero crime. The government is the largest employer, followed by tourism. I do believe this area of the world has got it figured out. We left all the wiser for our experiences, and I’ve been listening to French Café music ever since. Mesmerized by the songs of Evita. The drive home had us stopover for lobster in Freeport, Maine. That was followed the next day with lunch at Mystic Pizza and another ferry ride. SirOzzy was happy to have us home, but as always, we look forward to our next adventure. “Ces petites choses” translates to “these little things.” We should all strive to learn a new phrase in our host country’s language. A current snapshot in words. Wonderfully informative.